Delivery charges apply to all orders. Minimum order is $9.00. We stop delivering 1/2 hour before closing. Our delivery area extends from West Street to Hydraulic Street and from Lincoln Street to 55th Street South. If you have any questions, please call (316) 522-6662. We accept Visa, MasterCard, Discover, and American Express in our restaurant and over the phone for delivery orders. Personal checks are not accepted. Marchello's Restaurant does not sell or share the personal information you give to us with any other entity for the purpose of marketing their products or services to you. We restrict access to the information you give to us to those of our employees who need to know that information to provide products and services to you. We at Marchello's Restaurant are diligent in our efforts to keep the information you give to us confidential. Confidentiality is one of our main responsibilities in our continuing efforts to provide you with services and keep your trust. 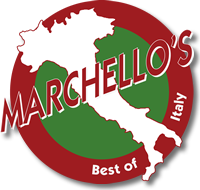 All media, text, images, logos, software, artwork, and other information contained on this website are owned or licensed by or to Marchello's Restaurant and protected under U.S. copyright law. This includes but is not limited to the design, arrangement, layout, and presentation of said materials. Copyright gives Marchello's Restaurant exclusive right to reproduce, distribute, perform, display, or license a given work. Federal law prohibits any and all unauthorized use of Marchello's Restaurant's copyrights without express written permission from Marchello's Restaurant.